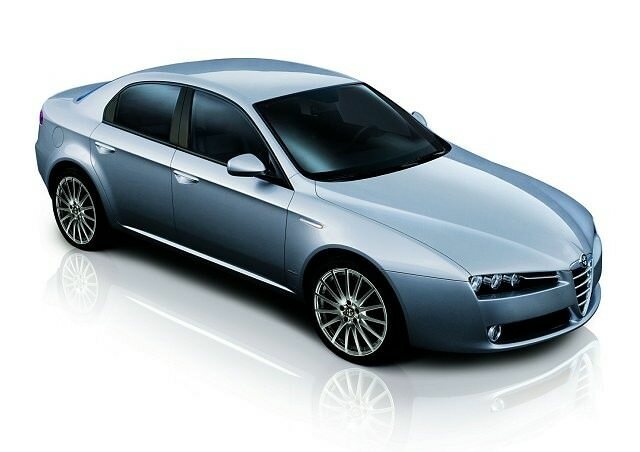 The Alfa 159 replaced the much-loved - and big-selling - 156, and delivered more of the same stylish appeal in the family saloon marketplace. The Alfa 159 replaced the much-loved - and big-selling - 156, and delivered more of the same stylish appeal in the family saloon marketplace. Sitting at the top end of the mainstream family saloon segment the 159 can be considered as much a rival for BMW's 3 Series, Audi's A4 and the Mercedes-Benz C-Class as it can for cars like the Toyota Avensis, Ford Mondeo and Volkswagen Passat. Being an Alfa the emphasis is very much on looks and a sporting drive, both of which it deliveries rather well indeed. The 159 was offered with a wide selection of petrol engines including 1.6-, 1.8- and 2.0-litre four-cylinder twin-spark units, as well as a pair of V6s in 2.5- and 3.2-litre capacities - the latter being reserved for the range-topping sporting GTA model. The diesel choice consisted of 1.9-litre JTD units in either 115/120hp or 140/150hp outputs or a 2.4-litre JTD offering with 175/210hp. All are front-wheel drive (four-wheel drive versions were offered in Europe), and the lower powered engine choices came as standard with a five-speed manual transmission - a six-speed manual was standard on the 2.0-litre petrol cars and above and the highest power 1.9-litre turbodiesels. The only car offered with an automatic was the 2.5-litre V6, it optionally available with a conventional four-speed automatic transmission. The saloon model was joined by a very smart looking estate in 2006, though it's not the most capacious load carrying car in its class - Alfa dubbed it the Sportwagon. No major styling changes occurred during its production, but the 159 did get some mechanical and interior revisions throughout its life, seeing power increases on all models - though the petrol engines were phased out of the range in its final years on sale. Inside, it's all familiar Alfa Romeo, so deep recessed instruments set off a sporty feeling cabin, with rather tight rear seat space - for head- and legroom. Build quality isn't up to the best of its rivals, though was a marked improvement over the 156. Tempting as the V6s are the punishing fuel bills will quickly dampen your enthusiasm. Best then are the 1.9-litre JTD turbodiesels, in either Lusso or Turismo specification - both should have alloy wheels and air conditioning. The 115hp version is adequate, though if you can find one of the higher power versions they offer much the same economy with only slightly reduced economy. It's unlikely you'll be considering a 159 without being aware of some of its foibles, as Alfa's reputation for reliability is not great, while running costs will certainly be higher than on most mainstream rivals. If you're prepared to put up with that then the 159 is an undeniably beautiful thing, which is so much more interesting than its dull competition.